When 2027 rolls around, you'll be happy to have these stocks in your portfolio. Holding onto a stock for 10 years is hard. The market goes up and down; opinion swings back and forth. What turn out to be temporary setbacks can look a lot more serious when your hard-earned dollars are on the line. But trading in and out of stocks in reaction to news will get you nowhere fast. Buying shares of good companies and holding them for many years is the best strategy, even though it's not the easiest strategy. What stocks should you entrust with your cash for the next decade? Four of our contributors have some ideas. Here's why Nike (NYSE:NKE), International Business Machines (NYSE:IBM), Align Technology (NASDAQ:ALGN), and Pioneer Natural Resources (NYSE:PXD) are stocks worth holding for the long haul. Dan Caplinger (Nike): The athletic apparel craze has continued to gain momentum, and as the veteran in the industry, Nike has taken full advantage. The company continues to use multiple distribution methods in order to maximize availability of its footwear and apparel, including both its own line of retail stores and deals with retailers to offer Nike products through their own third-party store locations. With an increasingly health-conscious consumer base around the world, Nike has made moves to broaden its appeal by extending its reach into globally popular sports like soccer. Nike has had to deal with increased competition recently, both from upstart athletic apparel companies in its home U.S. market and from well-entrenched rival Adidas internationally. Domestic concerns now appear to be less threatening, in large part because Nike's main opponent in the space has fallen on hard times and seen its own growth rate slow considerably from its former pace. But Adidas is vigilantly reestablishing itself as a global powerhouse in footwear and apparel. Nike has been able to survive similar competitive periods in the past, and would-be investors can benefit from the fact that Nike shares still haven't recovered all of their lost ground from a subpar 2016. For those with a long-term time horizon, Nike should be able to recover its momentum and deliver solid returns over the next decade. Tim Green (International Business Machines): Shares of IT giant IBM may be up more than 40% since bottoming out in early 2016, but more gains are likely over the next decade if the company can sustain its momentum. IBM has been engaged in a major transformation over the past few years, betting big on cloud computing, analytics, and artificial intelligence while exiting commodity businesses. 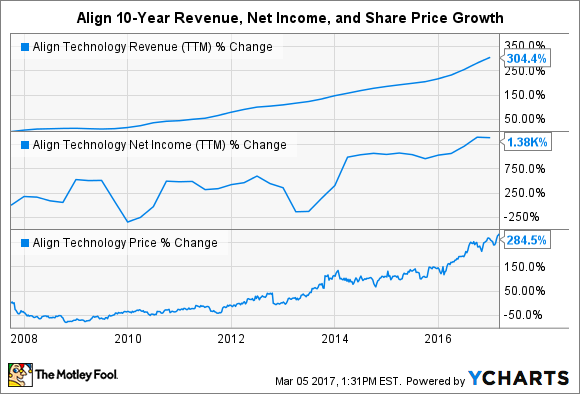 With adjusted earnings expected to return to growth this year after a series of declines, IBM's strategy is starting to pay off. One major benefit enjoyed by IBM is an existing enterprise customer base. Its mainframe systems continue to power the businesses of banks, retailers, and airlines, and 90% of global credit card transactions are processed on IBM mainframes. Relationships that in some cases span decades give IBM a leg up as it pushes into new areas. With IBM stock trading for roughly 12.5 times adjusted earnings guidance for this year, it won't take much earnings growth to drive the stock higher. A dividend yield of 3.2% makes the stock an even more attractive long-term buy. Pessimism about IBM's future is keeping a lid on the stock price. If the company can prove that its turnaround is for real over the next few years, it should be a great long-term holding. Brian Feroldi (Align Technology): Roughly two-thirds of Americans have malocclusion, which is a misalignment of the teeth. For decades the only way to fix this issue was to put in metal braces, but there's plenty of drawbacks to choosing to do so. Once braces are put in they cannot be removed. There are also dietary restrictions that have to be followed. Finally, a mouth full of metal isn't very attractive. Those factors cause many potential users to delay or forgo treatment altogether. A few decades ago, Align Technology pioneered an alternative treatment that it called the Invisalign system. This system consists of a series of clear aligners that are placed directly over the teeth. Every few weeks a new aligner is put in the mouth and it slowly works to realign the teeth. These aligners can also be removed at any time, so there are no dietary restrictions to worry about. Given the system's advantages over metal braces, Invisalign has been gobbling up market share in this market for years. In turn, Align's top and bottom lines have soared, treating long-term shareholders to an extremely profitable ride. ALGN Revenue (TTM) data by YCharts. Thankfully, I don't think this growth story will be ending anytime soon. Align believes that it only services 7% of its current addressable market, which gives the company plenty of room left for market-share gains. While shares are a bit pricey, I can't help but feel that Align is still a terrific stock to buy and hold. Matt DiLallo (Pioneer Natural Resources): Shale driller Pioneer Natural Resources recently unleashed an impressive long-term growth forecast. The company said that it has the resource base to grow its production from last year's rate of 234,000 barrels of oil equivalent per day (BOE/D) up to an average of 1 million BOE/D by 2026. That represents 15% compound annual production growth, which the company anticipates it can finance while living within cash flow starting next year at $55 oil and $3 natural gas. Furthermore, Pioneer expects to grow its cash flow at an even faster clip of more than 20% annually over that time frame. Fueling that higher growth rate is the anticipation that its oil mix will improve from 57% last year to more than 70% a decade from now, which will yield higher margins. In addition, the company anticipates that lower leverage and continued cost improvements will deliver further margin expansion in the years ahead. It's an impressive projection, to say the least. For perspective, only fifteen companies matched that growth rate over the past decade, many of which were tech giants. Those cash flow growth machines delivered market-thrashing returns over that time frame, achieving an average annual return of 19%. While it would be tough for Pioneer to match those returns given how volatile oil prices can be, it still has the makings of a stock that can deliver market-beating returns for the next 10 years.